Join the DailyTurismo as we search for low-buck classics at the Ruby's Diner Cruise at the Beach, located just a stones throw away from the finish line of the original Cannonball Baker Sea-To-Shining-Sea Memorial Trophy Dash. We hope that the web is frequented by car nuts like us: always on the lookout for something weird, cool, powerful, and cheap (or all of the above) to tool around town in and have a bit of fun with. Also if you're like us, you too check out local cruise nights and car shows every once in a while...but you are not the lawn-chair show goer who spends all week polishing their '57 Chevy only to spoil it with a fake "crying kid" leaning against the bumper wearing a crocheted sweater. What we mean to say is, in our roundabout way, that a local low-stress casual car show can be a good place to find your next Daily Turismo, if you know what to look for...and what to steer the hell clear of. 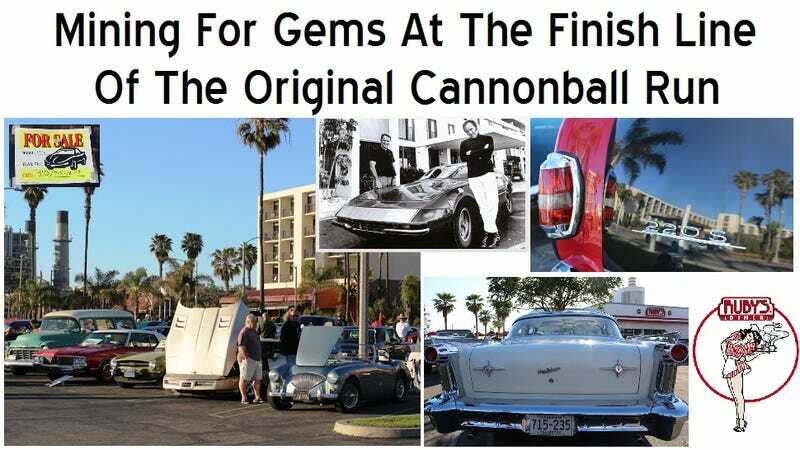 Follow along as we check out the cheap classic car market at our local Ruby's Diner "Cruise at the Beach" in Redondo Beach, California located steps from the Hotel Portofino, site of the finish line for the infamous Cannonball Baker Memorial Sea-To-Shining-Sea Trophy Dash. This is a great little "cruise night" style show that happens every Friday during the summer, in the parking lot of the '50s themed Ruby's near the Redondo Pier. Most participants are there to show off their pride & joy, but many of them are for sale as well. First up is this cheerful little 1975 Triumph TR6. This represents the last of a breed: the traditionally styled, small, nimble and traditionally unreliable British roadster. There is a major benefit to this TR6 over a later example or a TR7/TR8 (besides the obvious fact that it doesn't look like a doorstop). Being a '75 it is smog exempt in California, meaning that zero inspection is required on this thing...ever. Unless there is some weirdness in the title or VIN, neither the DMV nor the CHP have any interest in checking this car for emissions compliance. You could stuff a woodfired Stirling external combustion engine under the hood with no fear of persecution. Or the compact yet powerful American pushrod V8 of your choice. So many options, so little space under the bonnet. Overall this car presented very nicely, as a solid and worry-free driver. It would be perfectly fine to leave this stock and enjoy it as-is without worrying if your NOx PPM is 5 points over the limit. It showed evidence of being repainted in its off-green color and the carpets were a bit sun faded. Both of those can be expected, and we didn't see any other obvious faults. The only real glaring omission is the lack of a price on the for sale sign. The owner was nowhere to be found but we would have gladly chatted about the state of the TR6 market and inquired about the asking price. Somewhere in the $7k - $10k range would be our guess, and not unreasonable at that price point. The TR6 had a big 2.5 liter inline six as opposed to the puny sub-2.0L engines found in most other British roadsters, so it would be at the top of the list if we were looking for a summer fun car. The sellers phone number and photos of all the for sale signs are located on the DailyTurismo website here. Next up is a trio of Nostalgic overstimulation in the form of some 1950's American land yachts. This 1952 Mercury caught our eyes as a solid potential basis for a mild custom cruiser. Apparently that was the seller's intention; it has been lowered, painted a sort of flat purplish-gray with hand sprayed gloss purple accents, and given a set of what look like '57 Cadillac hubcaps and wide whitewall tires. Even though this is a 4-door it is fairly pleasing to the eye since the rear handles have been "shaved" for a cleaner look. There was an extensive handwritten poster on the dash with an explanation with all the specs, including the hotted up Flathead V8, Merc-O-Matic transmission, and body modifications. This is the kind of car you buy for $4000 or $5000, do a bit of basic cleanup, get it painted at your local "imported labor" body shop, reupholster and then turn around and sell at $10k - $12k asking price. After enjoying it thoroughly, of course! The only problem with that plan is that this seller is asking $14,500 or best offer for this half finished project. Now, a '52 Mercury is not exactly common anymore, but this car is a 4-door sedan and is far from what we would call nice, even if it is solid enough to be a daily driver. With about 5 minutes of searching online we came up with this stunner of a '54 Monterey sedan which is being sold by a dealer as a "one-owner" (emphasis on the quotation marks) survivor resplendent in red with a white top and shiny chrome, and a much more powerful OHV V8...all for $16,900 dealer retail asking price. Assuming a moderate profit margin for the dealer it should be theoretically possible to find a copy of that far nicer car for approximately the same price this Ruby's seller is asking for this one. Maybe Mr. Darren can be talked down from his value mountain, or maybe there is some unseen reason that his car ought to be worth almost $15k. Either way...intriguing at first glance but at this price we'd say it will likely not sell anytime soon. On the other hand, a far more sensible way to spend your $15k would be on this genuine survivor 1958 Oldsmobile Eighty-Eight sedan. It too is a four-door but being from the latter half of the decade it wears its extra portals with more panache and manages to still look the business while doing so. This thing features acres of chrome, lights galore, spears, shields, crests, and badges aplenty. It is a nice understated off-white with a light blue roof and matching two tone interior. This editor would gladly cruise all day and all night long down the higway in this behemoth...on someone else's gas budget...even better! This thing was so big I could not even fit it into my SLR's field of view while crouching five feet away, trying to get a simultaneous view of the Vern Johnson dealer badge and Ruby's Diner in the background. You can't replicate originality on a '50s American car like this, and you certainly couldn't make this car's 500 pounds of chrome shine so well within a $15k budget for the car. This one has been cared for and it shows. The 371 cubic inch (6.1 liter) Oldsmobile Rocket V8 engine was a respectable powerhouse in its day, and even now should move several tons of Detroit iron fairly well down the road. We did manage to find and talk with the car's seller...or actually a dealer friend of the owner who is selling it for him. There was some paint flaking and checking from what looked like a minor fender-bender repair on the rear right quarter panel - you can see it in the leading image of this post if you look closely. But apart from that this is a whole lot of style and originality for the money. Call the seller at the number to the right if you're interested, or talk to Jack at backinthedayclassics.com for more info. Next is this seafoam green 1953 Plymouth Cambridge that was hiding over in the far side of the lot. Being an early postwar Mopar it has a few odd details to the design but it's certainly more rare and interesting to the casual observer than an equivalent '53 Ford or Chevy, simply because you don't see one at every Friday cruise night. This is a 2-door sedan which has a big usable back seat like a 4-door but cleaner lines and higher value because of it. The little arch-shaped taillights are so cool and understated - compare these to the finned monstrosities of a '57 Plymouth from just four years later to see what we mean. The interior of this Plain Jane Plymouth was a lot simpler than the '52 Mercury above, but also much cleaner, more original and better maintained. If you want a '50s American car it's for the style - let's face it - so why install modern seats, mismatched materials, and gaudy cupholders and stereos? Keep it stock and tidy for maximum nostalgic impact. This car also appeared to be completely stock under the hood. Plymouth's flathead inline 6 engine was notoriously durable and reliable, so it's no surprise to see it happily still in place after all these years. An interesting feature is the heater core mounted way up front instead of under the dash or on the firewall. Likely this is due to the heater being an optional extra and the car not being designed for it from the beginning. If you like the "shoebox" style of early '50s car, this Plymouth is a good alternative to a more common Ford. Just look at the font they used on the Cambridge badge; it's like a Fender guitar or Frigidaire fridge; just right for the overall theme of the object. Unfortunately this car did not have a price listed either and the owner was not in sight. Instead of stabbing at a guess, we will just say hey - the phone number is right here if you're interested. It's a matter of personal taste and opinion, but this car would likely look even better on blackwall tires, simple steel wheels with dog dish or spider style hubcaps, and without the chrome headlight covers. The rest of the car is so clean and simple it would seem to make sense to stay with that theme...and stay classy, San Diego. That's all for the Market Watch portion of this posting; there were several more examples of American Iron for sale but these were the most pertinent for the DT discussion. To close let's just admire this late '50s Mercedes-Benz W180 "Ponton" 220S sedan, which was not for sale at the show. The black and red two-tone is likely a custom job but the paint work was impeccable and this interior had a serious aura about it. The dash is wood-grained and that steering wheel looks like it would better fit on the bridge of the Andrea Doria. Like the Plymouth above, understated and cool - the gentleman's cruiser. Unlike the Plymouth, bomb-proof German construction and a serious price tag when new. From the rear 3/4 view it looks a bit taxi-like but we can't imagine that the owner is unhappy with it. Why can't all cars be this pretty in closeups? For those who may be wondering, that is the Hotel Crowne Plaza in the background, not the Hotel Portofino. Normally we just walk right by any restored "tri-five" ('55, '56 or '57) Chevy since they are so common but this '56 hardtop was resplendent in its copper and cream motif. The interior was impeccably clean and immaculately restored. This has got to be a great beach cruiser with the wide bench seat and panoramic windshield. Overall it is always nice to appreciate someone else's hard work from the comfort of a pair of shorts and flip-flops while casually walking around by the beach on a late spring day in SoCal. Rough life for car guys around here! Sure you could buy a complete basket case, pour tens of thousands of dollars and a few years of time into fixing it up, and be left with a car that's worth less than you spend. It is a fine way to spend time as a hobby activity and this editor has done just that many times. But if you have automotive ADD and want to try out a smattering of interesting rides with minimal outlay, buy a finished car that's nice enough to be advertised at your local car show - and stay away from the 100-point show queens and overhyped auction listings. You'll likely make your money back when it's time to sell, and you just might have some fun in the process too.